National communism. A current within the Communist movement or Communist parties that attempted to reconcile national interests with Marxist-Leninist doctrine in order to sanction a national road to socialism. National communism emerged as a political phenomenon in Ukraine in 1918 and has had many counterparts elsewhere. The first Bolshevik to state a national-communist position was Vasyl Shakhrai, a leader of the Poltava Bolshevik organization. 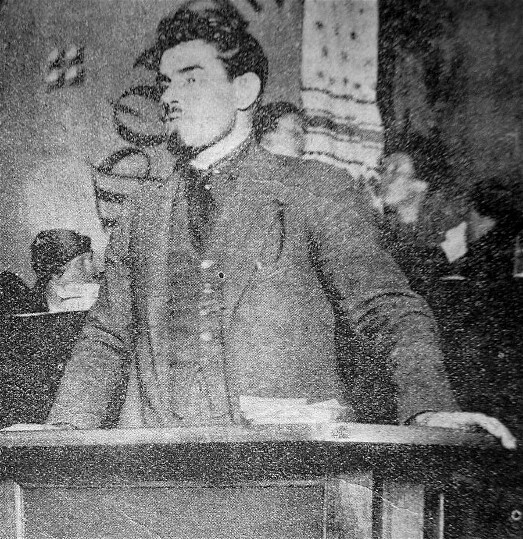 In the latter half of 1918 he wrote a pamphlet under the pseudonym Skorovstansky, Revoliutsiia na Ukraïni (Revolution in Ukraine), in which he argued that the national question had to be solved in tandem with social problems. In January 1919 Shakhrai and Serhii Mazlakh published Do khvyli: Shcho diiet'sia na Ukraïni i z Ukraïnoiu (Concerning the Moment: What Is Happening in and to Ukraine), in which they argued that the CP(B)U should be replaced by a separate Ukrainian Bolshevik party that would affirm Ukraine's language, culture, and rights as a state. Shortly before the collapse of the second Soviet republic in Ukraine in July 1919, a group of disaffected Bolsheviks led by Yurii Lapchynsky and P. Slynko formed in Kyiv. Later known as the Federalist Opposition, it advocated an independent Soviet Ukraine led by a new Ukrainian party that would select its own leadership and control its own military and economic resources. In subsequent months the group modified its position, in calling for a Russo-Ukrainian federation but insisting on equal rights. It also believed local Bolsheviks should merge with local pro-Soviet parties, notably the Borotbists, to form a new Ukrainian Communist party (UKP). Founded in January 1920, the UKP held views that had much in common with those of later Third World Marxist thinkers. It held that whereas imperialism threatened oppressed peoples with the loss of their national culture, it also promoted their economic development and thereby stimulated them to economic consolidation and national liberation. In the early 1920s the UKP spokesmen were the most consistent critics of the economic exploitation of Soviet Ukraine by the rest of the USSR. Consequently the UKP was dissolved by the Comintern in 1925. Its members were allowed to join the CP(B)U, and helped carry out the Ukrainization policy. Not only disillusioned Bolsheviks became national communists; so did Ukrainian leftists who became disenchanted with the policies of the dominant Ukrainian socialist parties. The Borotbists favored federation with Soviet Russia but refused any subordination of Soviet Ukraine to Russia and believed Soviet Ukraine should be led by Ukrainians. In March 1919 they were admitted into the Soviet government in Ukraine (see Provisional Workers' and Peasants' Government of Ukraine) led by Khristian Rakovsky, but had little authority. They then petitioned the Comintern to admit them as the legitimate representative of Ukrainian communism on the grounds that the CP(B)U was alien to the Ukrainian revolutionary process and, through hostility to everything rural and Ukrainian, had distorted and hindered the natural course of Ukraine's revolutionary development. Recognizing their usefulness, in November 1919 Vladimir Lenin forced the Russian-dominated CP(B)U leadership to begin negotiations with the Borotbists on merging with the CP(B)U. At the same time Lenin and Leon Trotsky issued statements promising to respect the Ukrainians' right to cultural self-assertion and promised Ukrainians ‘the right to rule their own country,’ albeit in a federation with Russia. The CP(B)U and the Borotbists merged in March 1920, and the Borotbist leaders Oleksander Shumsky and Vasyl Blakytny were elected to the Central Committee of the CP(B)U. Of about 5,000 Borotbists about 4,000 were admitted into the CP(B)U. All but 102 were purged during the following year. The successes of Ukrainization fostered the myth that Ukrainians had achieved a measure of national liberation within the Soviet framework, and led a number of prominent Ukrainian Communists to believe their national-communist views had been legitimized. Thus, as Ukraine's commissar of education in 1925, Oleksander Shumsky urged Joseph Stalin to replace the CP(B)U first secretary, Lazar Kaganovich, with an ethnic Ukrainian, Vlas Chubar, and called for faster implementation of Ukrainization so as to de-Russify Ukraine's cities and proletariat. Shumsky also defended Mykola Khvylovy, who argued that Ukrainian culture should take its models from Western Europe and reject Russian influence in order to liberate itself from the legacy of colonialism. Joseph Stalin, however, condemned both ‘Shumskyism’ and ‘Khvylovyism’ in April 1926. Because Oleksander Shumsky was supported by the majority of the leadership of the Communist Party of Western Ukraine (KPZU), the Comintern ‘deposed’ that leadership, thereby splitting the KPZU and ending its role as an influential force in Western Ukrainian political life. In 1927 Shumsky was removed from his Ukrainian post and transferred to Moscow. He was arrested in 1933, and died in a labor camp in 1946. Another casualty of Oleksander Shumsky's downfall was the national-communist view of Ukrainian Party history, which portrayed the CP(B)U as an amalgam of Russian Bolshevism and Ukrainian socialism, culminating in the Borotbist-Bolshevik merger. That ‘two roots’ theory, which was first enunciated in 1923 by the historian M. Ravich-Cherkassky (Rabinovich), was condemned in 1927, and a new, Stalinist, official history of the CP(B)U, by Nikolai Popov, was published in 1928. Mykola Skrypnyk, who replaced Oleksander Shumsky as commissar of education, was until 1933 the Soviet regime's and the Comintern's most authoritative spokesman on nationality policy and a defender of Soviet republican prerogatives as formulated in the 1923 Soviet Constitution. He consistently advocated policies that would make the Soviet system attractive to oppressed peoples living on the USSR's periphery. Skrypnyk also continued to lobby for Ukraine's economic interests with respect to both republican control over establishments located in the Ukrainian SSR and new construction. In February 1928 Mykhailo Volobuiev, Skrypnyk's subordinate in charge of political education, popularized findings of the economist V. Dobrohaiev demonstrating that Ukraine was being exploited fiscally by the USSR just as it had been exploited by the tsarist government. Volobuiev also criticized the Russian chauvinism of economic decision-makers in Moscow, argued that their centralized control distorted Ukraine's economic development and had harmful consequences for Ukraine's national and cultural life, and called for the Ukrainian SSR to strive for economic self-sufficiency. He was condemned for providing Ukrainian ‘bourgeois nationalism’ with an economic basis. In 1928–9 a campaign was initiated against the leading official Soviet Ukrainian historian, Matvii Yavorsky, whose views reflected Mykola Skrypnyk's orthodox national communism. Although he was criticized for many alleged errors, the most significant charges levelled against him were his overemphasis on Ukrainian ideas and figures in the Ukrainian revolutionary process, his having adopted many ideas from the writings of Mykhailo Hrushevsky, and his portraying Ukrainian history as distinct from Russian history. On 14 December 1932 Moscow ordered the CP(B)U to halt the ‘mechanistic’ implementation of Ukrainization and root out ‘national deviations’ from the Party line. The 1933 Party purge singled out ‘national communists’ as primary targets. Joseph Stalin appointed Pavel Postyshev as CP(B)U second secretary on 12 January 1933, and over the course of several months Mykola Skrypnyk and his views were condemned, and his followers were accused of spying and treason. The suicide of Mykola Khvylovy in May 1933 and that of Skrypnyk in July 1933 mark the end of openly expressed national-communist ideas in Ukraine. Modest attempts to reconcile Ukrainian aspirations with communism, however, continued to arise. In 1965 the literary critic Ivan Dziuba wrote a major restatement of national-communist ideas in his critique of Soviet nationality policy, Internationalism or Russification?, and the Ukrainian dissident movement of the 1960s and 1970s had other national communist thinkers (eg, Yurii Badzo). Moscow's continuous opposition to national-communist ideas resulted in the 1972 removal of the first secretary of the Communist Party of Ukraine, Petro Shelest, on the grounds of ‘bourgeois nationalism.’ After the advent of glasnost in the mid-1980s, greater tolerance for national-communist ideas became evident, and the Party press published articles favorable to major national communist figures of the past, including Oleksander Shumsky, Mykola Khvylovy, and Vasyl Shakhrai. In the Soviet Union outside Ukraine, national communism was most often associated with Mir Said Sultan-Galiev (1880–193? ), a prominent Volga Tatar Communist who became disillusioned with Vladimir Lenin's nationality policy toward the Moslem peoples and evolved his own variant of national communism. From 1929 to 1939 thousands of Communists of Moslem origin were arrested for ‘Sultan-Galievism.’ In addition the Jewish Communist party, an offshoot of the Poale Zion party that upheld a fusion of communism and left-wing Zionism, was allowed to exist until 1924. National communism had more success outside the Soviet Union. Under Josip Tito Yugoslavia broke with Joseph Stalin on national grounds in 1947. In 1956 both Poland under Władysław Gomułka and Hungary under Imre Nagy sought national roads to socialism. Hungary's attempt was crushed by Soviet military intervention, but Poland's achieved some successes before sinking into political stagnation. In breaking with the Soviet Union in the early 1960s, China was able to create a communist state relatively free from outside influence, the basic goal of national communism. Czechoslovakia under Aleksander Dubček also sought its own national road to socialism, but its attempt too was aborted by Soviet military intervention in 1968.